INDIANAPOLIS (AP) – Dallas Clark knows there is no such thing as a perfect game or a perfect season in the NFL. The goal is to keep improving, no matter what the record-breaking stats suggest. So after posting the two best seasons ever by a Colts tight end, back-to-back, Clark has returned to Indy to chase perfection. Clark was so busy working out Monday that he didn’t even have time to answer questions in the locker room. But starting over isn’t exactly what the Colts have in mind for the new dad. Almost from the moment Indy drafted Clark with the 24th overall pick in 2003, Peyton Manning & Co. could see how valuable Clark could be in this high-scoring offense. He’s fast enough to burn defenses daring to cover him with a linebacker, agile enough to make circus catches and shifty enough to fake out anyone measuring him up for big hits. It’s a rare combination for a 252-pound guy, which is also why Clark is among the NFL’s best tight ends. Since signing a six-year, $41.76 million contract in 2008, Clark has proven to be worth every penny. Over the last two seasons, he has 177 receptions, produced the first 1,000-yard season of his career, become the second tight end in league history to haul in 100 catches in a season and, yes, even earned that elusive first Pro Bowl trip. His numbers even broke the franchise records John Mackey set in the ’60s. 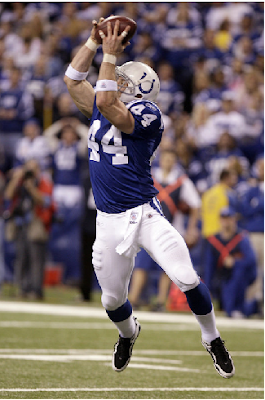 Clark played a key role in the Colts’ Super Bowl run in 2006, and his versatility to split out as a receiver and create mismatches is one of the reasons Indy is so proficient in the no-huddle offense. Not bad for a former college walk-on who needed seasons to learn all of the nuances of Indy’s offense. His new job is to teach the rest of his four-man gang his old tricks. Clearly, the Colts are loaded in the passing game. The only four-time MVP in league history will spend this season distributing the ball to perhaps the most talented receiving corps he’s ever had. There’s Clark and Pro Bowl receiver Reggie Wayne, emerging contributors in Austin Collie and Pierre Garcon and former first-round pick Anthony Gonzalez. Add Tamme and rookie Brody Eldridge to the mix, and the toughest job for the Colts might be keeping everyone happy. The only other real question is health. Gonzalez lost his job as Wayne’s complementary receiver after going down with a season-ending injury in the first quarter of last season’s season-opener. He pulled a hamstring in the offseason but now says he’s healthy heading into Sunday’s opener at Houston. Clark, however, missed the entire preseason with an undisclosed upper left leg injury. That left most of the snaps to Tamme, a three-year veteran, and Eldridge, who is considered more of a blocking tight end than a Clark clone. Coach Jim Caldwell hasn’t said whether Clark will start against the Texans, but Clark did practice Monday and has “guaranteed” he will be on the field this weekend. So what does Clark have planned for an encore?